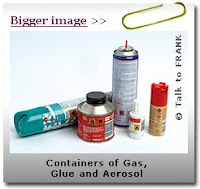 Solvents cover a huge number of substances: gas lighter refills, aerosols containing hairspray, deodorants and air fresheners, tins or tubes of glue, some paints, thinners and correcting fluids, cleaning fluids, surgical spirit, dry-cleaning fluids and petroleum products. When inhaled, solvents have a similar effect to alcohol. They make people feel uninhibited, euphoric and dizzy. Users say it's like being drunk with dizziness, dreaminess and fits of the giggles. And it can be difficult to think straight. Depending on what's being inhaled, you can hallucinate. This can last for up to 45 minutes. The hit is quite short so users tend to keep repeating the dose to keep the feeling going. It can give people a 'hangover' afterwards, giving them severe headaches and leaving them tired. Depending on the substance, it can leave a red rash around the mouth. There's no evidence that inhaling solvents can make a user physically dependent although a tolerance can build up within 2-3 days of continual use. It’s possible to be psychologically dependent (with a desire to keep using even in spite of potential harm). All household have different substances which, when abused, can cause different effects. Solvents are sniffed from a cloth, a sleeve or a plastic bag. Some users put a plastic bag over their heads and inhale that way. Gas products can be squirted directly into the back of the throat which makes it difficult to control the dose. *People can experience vomiting and blackouts. *There’s a risk of fatal heart problems which have been known to kill users the very first time they sniff. *Squirting gas products down the throat is a particularly dangerous way of taking the drug. It can make your throat swell so you can't breathe and slows down your heart. *You risk suffocation if you inhale from a plastic bag over your head. *Sniffing can seriously affect your judgment and when you're high there's a real danger you'll try something reckless. *Long-term abuse of solvents has been shown to damage the brain, liver and kidneys. *It can be hard to get the amount right. Just enough will give the desired high – a little too much can result in coma. *Using solvents in combination with alcohol can lead to an increased risk of death.